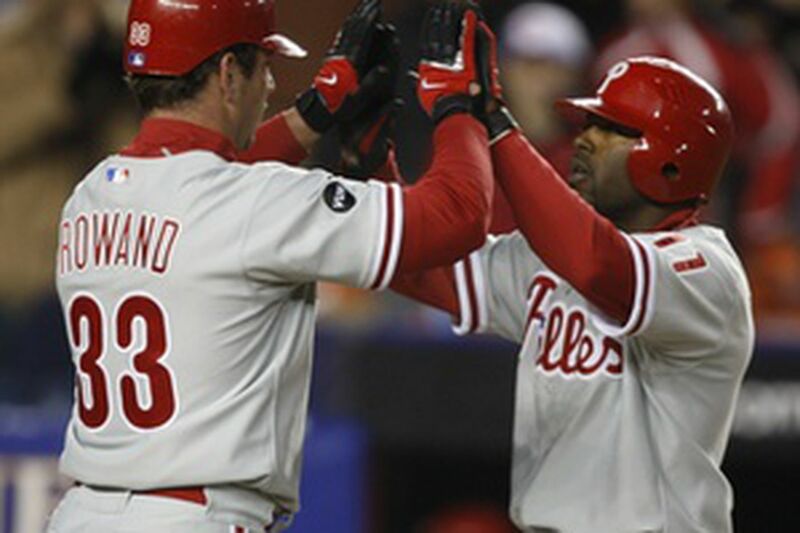 NEW YORK - After a sputtering start, Jimmy Rollins did plenty to back up his contention. Rollins hit homers in the first and second innings in last night's 5-3 loss to the Mets, which gave the Mets the series, two games to one. The loss left the Phillies 2-7, well on their way to a fourth straight losing April. Does he regret his words? "Nothing has changed," Rollins insisted. "It's nine games into the season. We can catch fire. We'll be right where we need to be." At least he stands his ground. In January, Rollins infamously declared his Phillies, with improved starting pitching, the "Team to beat . . . on paper" in the National League East. That mildly annoyed some Mets fans and, eventually, with prodding, some Mets, who won the division last year. Rollins committed an error in the Mets' seven-run eighth inning of the series opener Monday. That provided the Shea faithful plenty of ammunition with which to heckle the shortstop. He went 0-for-6 in the first 14 innings of the series, even grounding into a doubleplay. He defused their ire often afterward. Rollins' triple in the sixth inning Wednesday led to an insurance run in that 5-2 win. Last night, he homered off Tom Glavine to start the game, then drove in Aaron Rowand with a two-out homer in the second to gave the Phillies a 3-1 lead. In a battle of ancients - Jamie Moyer, 44, and Glavine, 41, are the oldest lefty starters to face each other in major league history - Moyer couldn't make that lead stand. Third baseman Wes Helms' second error of the season led to the Mets' second run, in the bottom of the inning, when he threw away Glavine's sacrifice-bunt attempt with two men on. A run scored from second on the play. In the fourth, Moises Alou's leadoff double, Damion Easley's one-out walk, Glavine's second sacrifice and Jose Reyes' two-run single made it 4-3. Reyes, Rollins' opposite, was electric throughout the series, reaching base in eight of his 14 plate appearances, going 5-for-12 with four RBI, three runs scored and two stolen bases. He had third stolen in the first inning, too, and because of it the Mets got a run instead of a doubleplay. With a runner on first and no outs, Reyes took off for second. Helms left his position early to cover and Carlos Beltran pulled a pitch to the spot Helms vacated. "[Reyes] can do a lot of things," manager Charlie Manuel marveled. The Mets added a run in the seventh off Clay Condrey when David Wright tripled then scored on Alou's single. Moyer was game - six innings, three earned runs - but he was a little wild, too. On a cold, wet night he hit three batters, though none of them scored. He struck out Beltran with the bases loaded to end the sixth and kept the Mets' lead at 4-3. He fanned Carlos Delgado twice and coaxed a groundout, too - significant, since Delgado entered 26-for-57 against Moyer. Moyer came in higher and tighter than he meant to with the first two pitches of Delgado's first at-bat, which came in the first inning with two on and no out. "Maybe I learned something with those two mistakes," said Moyer, now 1-1. "I don't want to hit guys. But maybe I should do that to some other hitters." Glavine (2-1) was a little better. After Rollins' second homer, Glavine faced the minimum number of Phillies through the sixth - a trend the Mets continued through the eighth, thanks to three doubleplays. Glavine got one in the fourth, Joe Smith got one in the seventh and Scott Schoeneweis got one in the eighth. Mets closer Billy Wagner collected his second save with little drama; he allowed Ryan Howard a one-out double but settled and got Pat Burrell and Wes Helms. Rollins' prediction rings hollow now, with the Mets at 6-3, Atlanta at 7-2. Relax, said J-Roll. The Phils led the league in runs scored last season. With essentially the same lineup, the offense will come, despite the fact that it has managed three runs or fewer in three of the first nine games. They will eventually hit with runners in scoring position. They were 3-for-23 in the series and last night's 1-for-5 put them at .181 - a two-point increase. "We're still trying to get our feet under us," Rollins said. His never left the ground, despite his rough first 14 innings. "I love it," he said of the heckling he heard here. "It's a lot of fun out there."